Stovetop kettle with gooseneck spout. Ergonomic handle made of phenolic resin, lid and base made of BPA free Polypropylene. Works on both traditional stovetop or induction surfaces. ★☆☆☆☆ I ordered the product in February and only after 2.5 months of use the handle has two cracks at the top, right next to the screws. The programmable feature is excellent. If not for the handle issue, I'd give this product a 5 Star Rating. I have to give it a 1 Star Rating because after paying a premium price for a programmable electric kettle, I'm now worried the handle will break off soon and become useless. 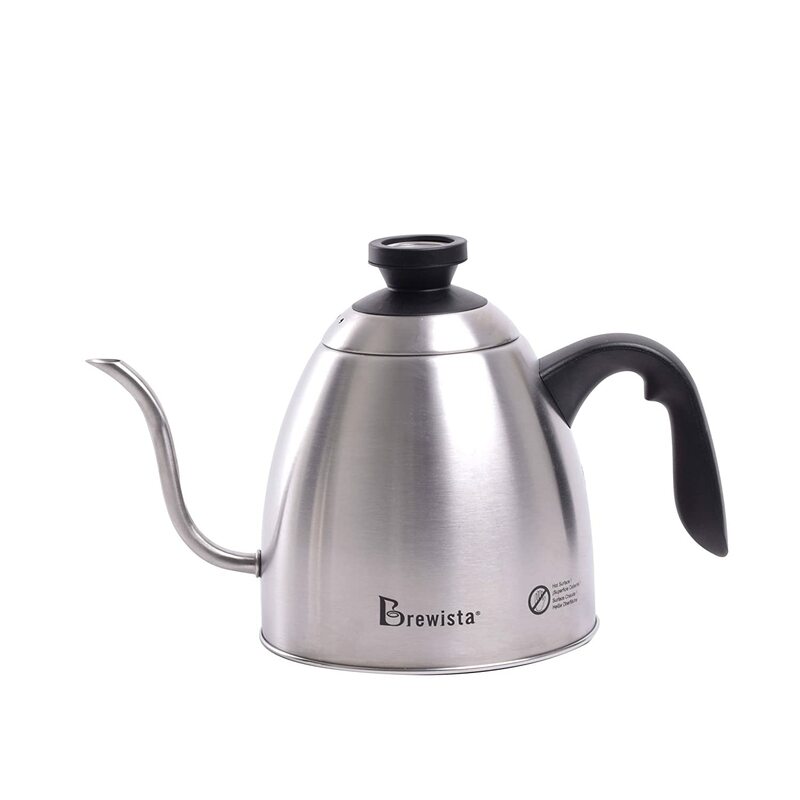 ★★★★★ Great kettle for pour over coffee! Pouring is smooth and the kettle feels well-balanced. Love that you can customize the temperature, and/or use the presets. The temperature hold feature is key for my morning routine. If you're deciding between this one and the Bonavita, get this one! I had been using the Bonavita gooseneck kettle which functions similarly but the Bonavita kettle changed color and rusted just a few months into using it. Also, the Bonavita kettle requires the ugly plastic protector over the base. So far, so good with the Brewista kettle! ★★★★★ Very good product and even better customer service from Brewista. I had my kettle for 10 months when it would no longer heat. I contacted Brewista and they sent a replacement right away. I use the kettle very often for pour over coffee, tea, and other specialty drinks. I am happy with the consistent and controllable pour of the spout. Would definitely recommend the product & have been even happier with the excellent customer service.